The weather for my hike weekends this year has been, in general, less than ideal. The previous hike weekend the weather turned and was not favorable either Saturday or Sunday and I ended up hiking Monday. Early in the week it looked as if this weekend would follow the same pattern. Thunderstorms were forecast for Saturday afternoon and rain for Sunday morning. Fortunately by Saturday morning the weather had shifted and Sunday was predicted to be nice, albeit windy; 15 – 20 mph with gusts over 30 mph. I set out on the long drive to the trailhead, heading west on NY 17 / I-86. The wind whipped at flags I saw along the drive and pushed my car around on the road as higher gusts blew up, but the sun was bright and the temperatures were warm. I arrived at the trailhead shortly before 8 am; the same place I had parked at for my last hike, but this time I was heading west. The wind was blowing around in the treetops, but down below it was not as strong. After putting my boots on and getting my GPS readied, I set out on the trail (mile 0.0 – 8:02 am). 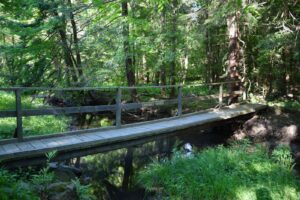 Almost immediately after leaving the road I came to a set of bridges over a stream; Mahlon’s Bridge according to a sign on the first. I stopped to take several pictures before crossing. Once across the trail started to climb, rising about 350 feet over the next mile. After leveling out the trail passed through an area of pine trees; the sounds softened by the bed of pine needles underfoot and the strong smell of pine in the air. I have always enjoyed walking through these little pine alleys. 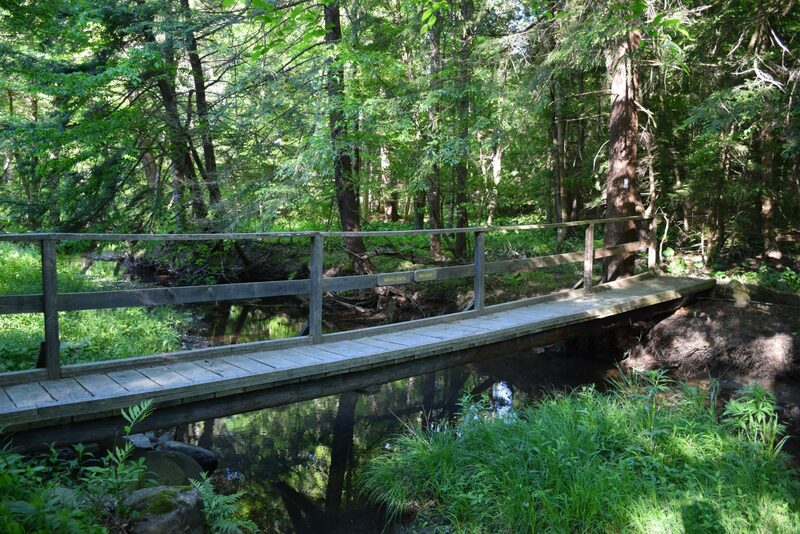 The trail left the pine grove and descended briefly to cross a small stream before climbing back up again to cross over Urbana Road (mile 1.2 – 8:36 am). At Urbana Road the trail jogged up the road a short distance and then headed back into the woods. The trail here had been recently mowed, cutting a path through the tall grass. The mowed path continued to climb for about a 1/2 mile before leveling out. It was here that I saw another hiker and her dog heading toward me (mile 1.7 – 8:48 am). In all the years and all the hikes I have taken I have rarely encountered other hikers outside of the busy towns, such as Watkins Glen and Ithaca. It is always something of a surprise to see other people. The hiker coming toward me was equally surprised to see someone. We stopped to say hello and chat. I learned that the dog was Alfred P. Dog and this was his thru-hike. He was hiking with his human and pack carrier, Marnie. 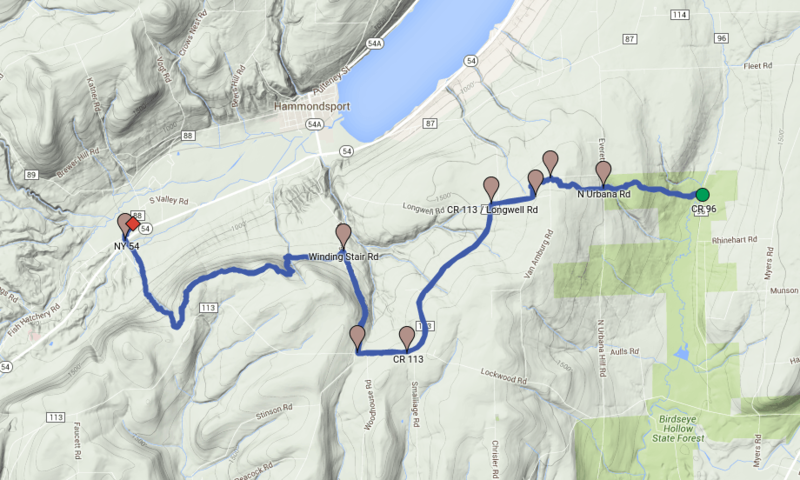 They had recently posted on the FLT email list about the start of their thru-hike. I was excited to meet a thru-hiker; there are few that can, and will, conduct a thru-hike and to meet someone doing it is a treat. I introduced myself and they had heard of me and had seen my blog. 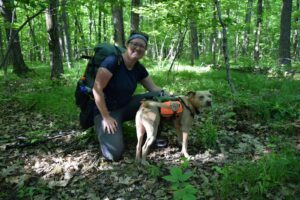 We chatted about the FLT and hiking in general; the surprise at seeing other hikers – probably because the trail is long and not well known, which is both good and bad; the physical and mental requirements of hiking 20 or more miles at a time; and road walks – I knew I had a long road walk ahead of me. I learned that Alfred did not like road walks much at all either; which I completely agreed with – even more so after this hike. 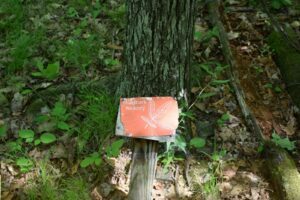 Finally, I gave them some insights on the trail ahead, both the immediate area and the Catskills region. I wished them happy hiking and I headed on. Soon after I came to Van Amburg Road (mile 1.9 – 9:20 am) and crossed. I came to a sign post indicating mileage to nearby points on the trail. Below the mileage sign a new smaller sign had been added indicating that a new lean-to was 100 yards to the west. I proceeded on and found the lean-to; it was indeed new. It looked as if it had only been built within the past few months. There was a trail register hung from a small tree nearby. 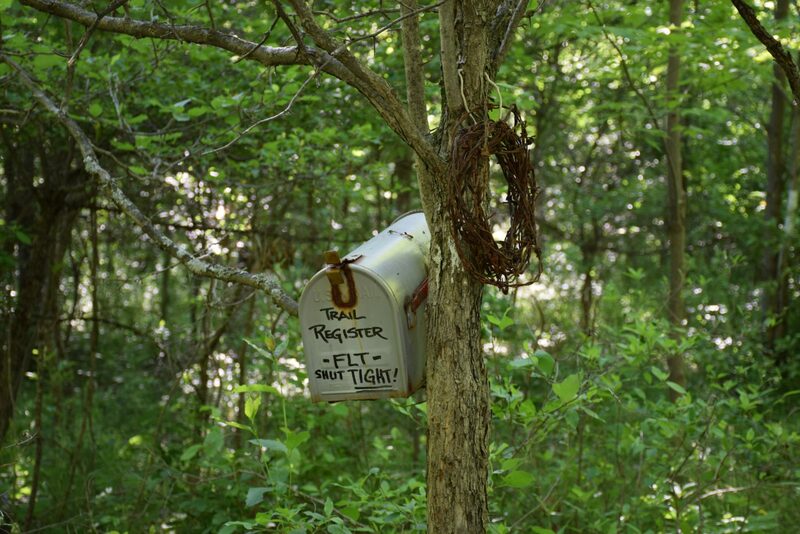 It was an old aluminum mailbox complete with the red flag. A coil of barbed wire hung on the opposite side of the tree. I signed the register and took some pictures of it and the new lean-to before continuing on. I arrived at Longwell Road and the beginning of the long road walk (mile 2.4 – 9:34 am). The information I had indicated that it would be nearly four miles long. I had decide to pack my sneakers and attempt to jog a little in order to complete it quicker. I dropped my pack and changed into my sneakers. I also took the time to grab a bottle of water and a snack and prepare myself for the long walk ahead. After finishing the my water and snack I cinched up my walking stick to the back of my pack; I wouldn’t need it for the road and it would allow me to move faster. I picked up my pack and headed down the road. I started off at a fast pace down Longwell Road, a hard-packed dirt and gravel road. The dirt was light colored and the sunlight reflected up in my eyes making me squint. A short time later I came to the intersection of Longwell Road and CR 113 and I turned left on CR 113 (mile 2.9 – 9:49 am). It was a small paved country road and had a double-yellow line down the middle. I attempted to jog a little, but found that having a heavy pack on my back made it difficult. I settled for a fast walk along the flats and uphills and a short jog when I was heading downhill. I was glad that I had chosen to wear sneakers for this road walk, my feet felt much better than they would have if I had kept the hiking boots on. I trotted along at a brisk pace, trying to move as quickly as I could. All the jostling kept dislodging my walking stick causing it to slide out and I had to keep pushing it back into place. I finally decided to stop and re-position it. I found a scenic overlook along the side of the road and took a moment to take some pictures as well as to fix my walking stick. I re-shouldered my pack and continue to climb up the road. At the top of the climb I came to a split in the road. One section heading back away from me at an angle and CR 113 continuing on ahead. 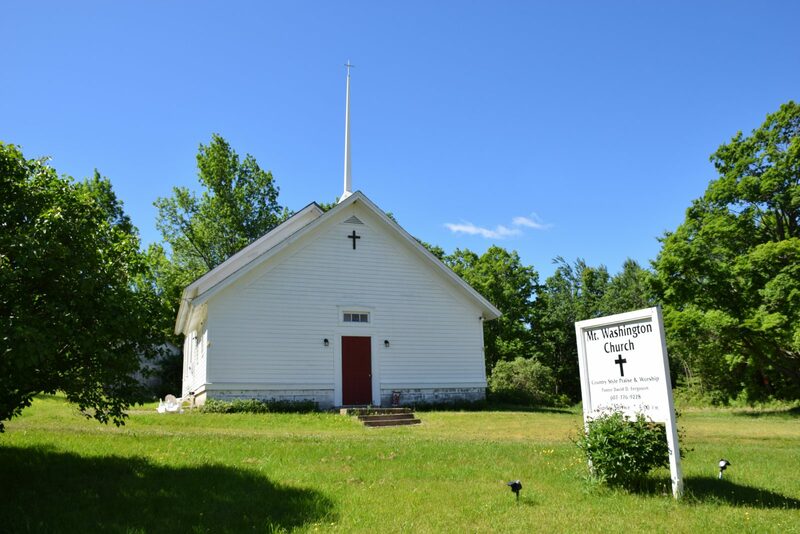 I continued to follow CR 113 ahead and passed by a country church, Mt. Washington Church; the sign in front promising, “Country Style Praise & Worship”. A short distance after I came to the intersection of CR 113 and Winding Stairs Road (mile 5.3 – 10:29 am). A dark red barn sat to my left. I stopped to take several pictures; the dark red against the blue sky and the green of the trees was a perfect contrast. On the corner of Winding Stairs Road sat a beautiful old farmhouse, white with a green roof and a white fence. I continued on down Winding Stairs Road walking quickly, sometimes jogging, and finally came to the trailhead; it had taken me just over an hour to walk/jog the 3.9 miles of road walk (mile 6.4 – 10:46 am). I left the road and headed up into the woods on the trail and found a shady spot to sit and change back into my boots. I also had some water and a snack; the road walk had been hot and thirsty work. After a short rest I started out again. As I walked along something orange caught my eye. 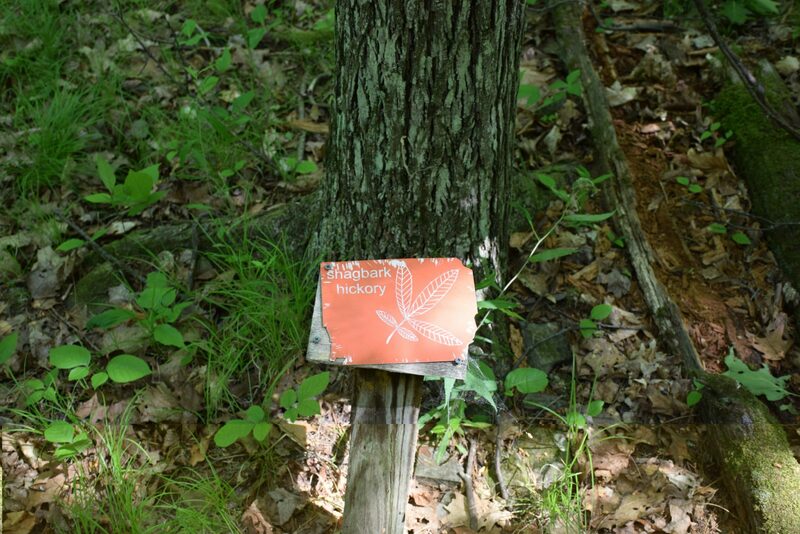 I stopped to look and found an old placard in front of a tree indicating that the tree was a “Shagbark Hickory”; a strange sight to find out in the woods. Perhaps this had once been a nature trail. I kept my eye out for other placards and a short distance later I found another with information about wild turkey. I continued to look for others, but found none. The trail crossed over a small stream and then climbed up to a trail junction and trail register (mile 7.0 – 11:12 am). The main FLT turned to the left and continued to climb up the hill and the blue marked June Bug Trail and campsite turned to the right and headed down the hill. I signed in at the trail register and then began the climb up the hill. I wound my way along through a few switchbacks as the trail climbed before turning to the right. It leveled out and continued along near some fields and past a cell tower. I came upon another set of hikers; two men this time. They had stopped for a rest and to get their bearings. They asked me how far back the road was and told me the map they had wasn’t very good. I had downloaded the FLT M12 map on my phone and opened it to show them where we were. After looking at the map they decided to head for the blue marked June Bug Trail and then back down into the little town of Urbana which would get them close to where they had parked. I wished them happy hiking and continued on. The wind was still blowing, and on top of the hill it was stronger. I felt a little chilled from it, but I kept moving. I passed through the edge of a small field before the trail turned to the right and began to head down to Urbana. 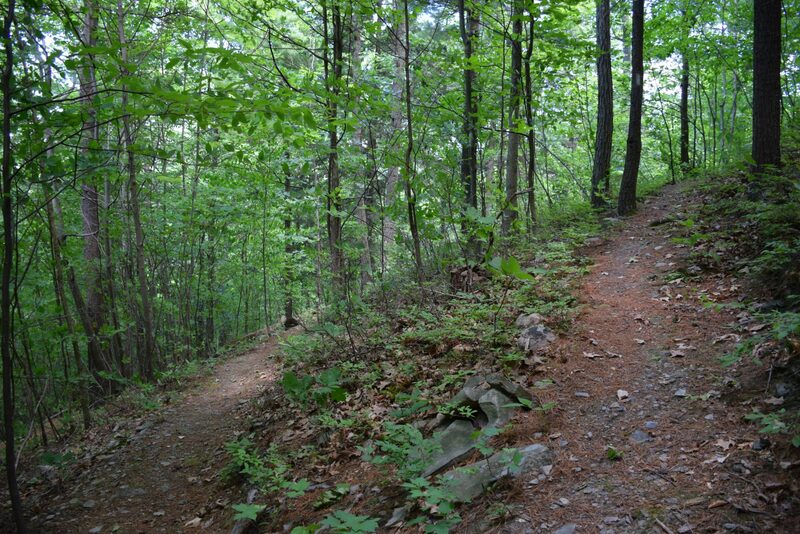 The trail wound back and forth through numerous switchbacks over the steep sections of trail before finally leveling out and opening out on a small private dirt road that headed out to NY 54 (mile 10.0 – 12:38 pm). I walked down the private drive and out to the shoulder of NY 54, a very busy highway. An old shop sat on one side and a hotel called the Vinehurst Inn on the other. Cars flew by in both directions and I had to wait for a time before I could cross the road to CR 88 on the other side. Once I was across I started down CR 88 and looked back toward the hotel. I could see a cell tower on top of the hill above the hotel and I remembered that the trail had passed near a cell tower. Seeing the scale reminded me just how much of a climb down I had taken – and how much of a climb back up I had ahead of me. A short walk past the town hall I found the trailhead, and my turnaround (mile 10.4 – 12:50 pm). The trail turned off to the left through a vineyard – the grape leaves green and growing. At the edge of the road a parking area specifically signed for the FLT, a pleasant surprise. This would be where I would park on my next hike. I took a few pictures and then started back. 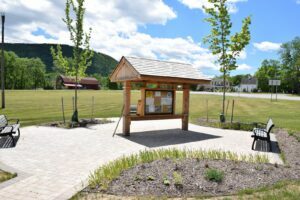 I stopped at the Pleasant Valley Trailhead area next to the town hall. It consisted of a small pavilion with a glassed case and information on the FLT, NCNST, and other trail information. There were also a number of benches here. I thought about stopping to eat my lunch here, but it was very windy and out in the sun with no shade; I wanted to find some shade and little shelter from the wind so I left the trailhead and benches behind. I crossed back over NY 54 and then down the private road. I headed back on to the trail and just before the trail started its long climb up the hill I stopped (mile 11.0 – 1:07 pm). I found a couple of trees and slung my hammock. I sat down, took off my boots, and relaxed while I ate my lunch. After resting for a while I prepared myself for the climb up the hill, a climb of 700 feet over just under a mile. I started up the switchbacks and I was glad to have the wind blowing as it cooled me off for the climb. 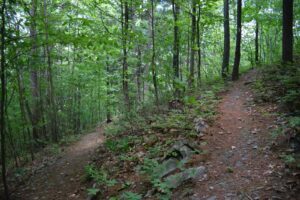 I pressed on up the hill, back and forth along the switchbacks, until I finally made it to the top and turned to the left to follow along the ridgeline. At the top of the hill the wind howled. It never stopped, just changed in intensity. The constant sound of it started to make my ears ring. Now that I was finished with the climb and was no longer exerting myself I started to feel a little chilled again. I kept moving along, all the while the wind howled in my ears. Finally I started back down towards the June Bug Trail and came to the junction (mile 13.9 – 3:06 pm). Here the wind was not as strong because it was more sheltered. I stopped to sign the register and then turned to head toward Winding Stairs Road. I passed by the orange placards again, looking again for others, but finding none. Before long I was back at the same spot I had stopped at earlier to change out of my sneakers and back into my boots. I stopped here again and did the reverse, changing into my sneakers for the long road walk. I turned out on to the road (mile 14.5 – 3:38 pm) and headed up – I had forgotten how much of a downhill it had been on my way out, now I had a long climb up the road, and I was tired. I moved along as quickly as I could up the road. I didn’t try to jog – I was just too tired. 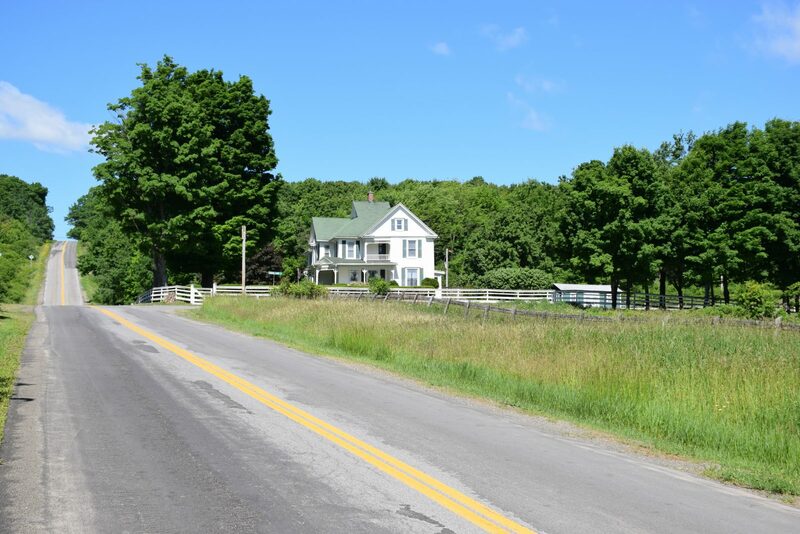 I made it to CR 113 and turned left leaving the old farmhouse and barn behind (mile 15.6 – 3:57 pm). I passed the church, noting that service would start in a couple hours. I continued to push along, trying to jog a little when the road headed down. It was difficult to maintain the pace for very long; I was tired and my pack was still heavy. Finally I was back at the intersection of Longwell Road and yet another climb (mile 18.0 – 4:35 pm). I trudged up the road. In the distance I could see some yellow road signs and I thought that the FLT trailhead was near the signs. I kept them in my focus and they slowly got closer. I was nearly halfway to the signs when I saw the FLT trailhead marker, and it was closer than the signs. With a last push I made it to the trailhead and dropped to the ground (mile 18.4 – 4:42 pm). Even though I was tired it had taken me only slightly longer to make the trek back, although it felt as though it had taken much longer. I shrugged my pack off and got out my water. I drank two bottles and ate an apple and rested before I changed back into my boots and headed on. I was re-energized, I had made it back to the trail and now had just a little over two miles to go. The remainder of the hike was uneventful. I stopped at the trail register near the new lean-to to sign again and then crossed Van Amburg Road. I made my way past the spot where I had met Alfred and Marnie. 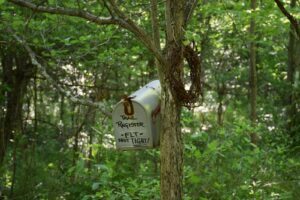 I briefly wondered where they were now and what their destination was for the day; I guessed they would probably stop at the Moss Hill Lean-to which sits at the intersection of the Crystal Hills trail. After crossing Urbana Road I passed back through the pine grove and took some pictures before heading downhill toward the bridges. I crossed the two bridges and I knew I was almost there. A quick turn to the left and then back to the right and up to the road and I was there. I had made it, nearly 21 miles and 7.8 miles had been road walk (mile 20.76 – 5:56 pm).